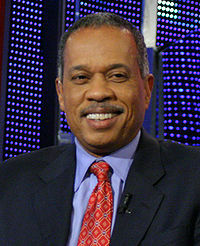 Juan Williams is a full-time commentator for the Fox News Channel, where he exchanges liberal or left-of-center commentary with Sean Hannity, and formerly Bill O'Reilly. He had been a commentator for National Public Radio since 2000, but was abruptly fired last year after his on-air mention of his "visceral fear of people dressed in Muslim garb at the airport", which his bosses said had violated "NPR’s values for editorial commentary" (even though he made his remarks on a different network). Williams also formerly worked as a columnist for the Washington Post for over 20 years. He is the author of Eyes on The Prize: America's Civil Rights Years, 1954-1965 and Thurgood Marshall: American Revolutionary. Williams' dismissal from NPR set off a firestorm of controversy over free speech, censorship and Liberal intolerance from a taxpayer funded Government Sponsored Entity. NPR's chief operating officer Vivian Schiller publicly defamed Williams during his firing. ↑ Shiller graduated from Cornell University with a Bachelor's degree in Russian studies and Soviet studies. Prior to becoming CEO, Schiller was a senior vice president of NYTimes.com. This page was last modified on 9 April 2019, at 11:06.